I'm catching up on work and getting back into the daily grind, so I have a quick post today. What I wore to work today was a bit bohemian-ish. Somehow though, I think I still managed to make it work for the office. The skirt I'm wearing is actually a maxi dress, my goal was for the belt to provide some waist definition and give it a little high waisted feel. 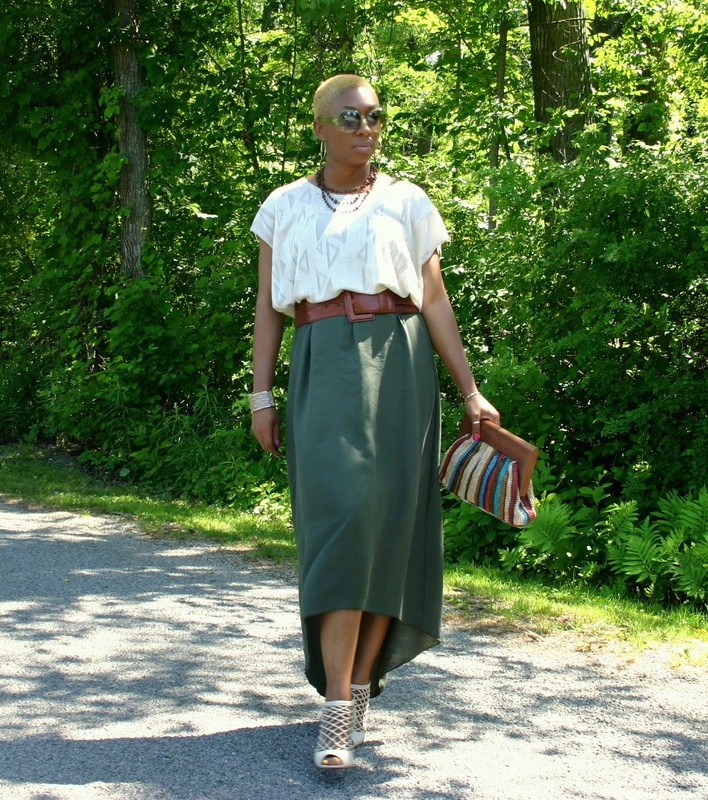 Olive is a hue that works in summer and fall, and I've rocked this maxi dress/skirt in the colder months too with colored tights and platform sandals. Sounds strange, right? It was cute, I promise! I'll have to remember to recreate and post that look when it gets cooler. I've actually never worn this maxi dress as a dress, I've always covered it up with another piece, it just doesn't seem as flattering the "normal" way. But perhaps I'll try it again before the summer ends....*sigh* I mean around here, summer is like halfway over. I wonder if we could get as lucky as we did a couple years ago and get another snowless winter. That would be fantastic. Well, I'm off - I hope you beauties have a terrific Tuesday! Thanks so much, Claudia! I really appreciate you noticing my little spot on the web!